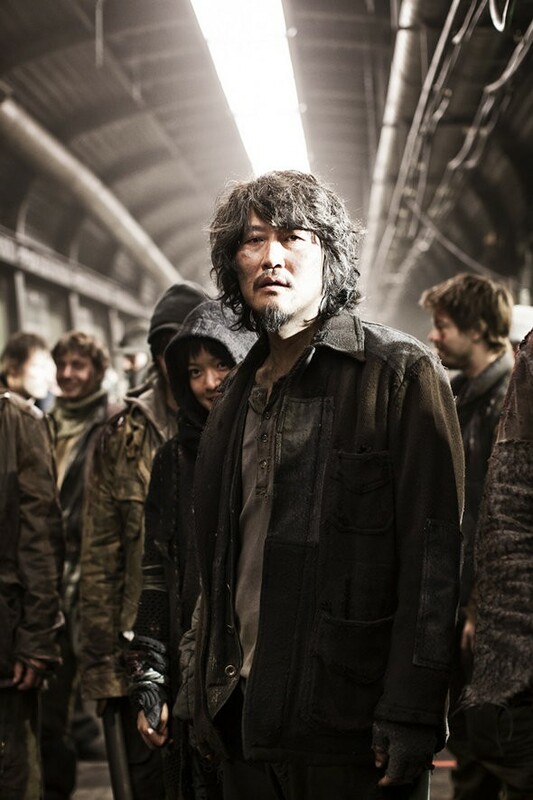 SNOWPIERCER —-as dystopian future sagas go, this stunningly inventive 2013 hurtler can give any other in the burgeoning subgenre a run for the money. Our artists have been telling us for some time that we’re headed to a cliff, and whether it’s hovering space stations, banned children, hunger games or zombies, the message is—the Have’s have us, and we’re going down. Might as well give ’em the finger as we fall, and in this bleak but whipsmart international production, we get 126 minutes to battle Fate for Freedom, and maybe drop a few underlings on the way. Why not? Miscalculated atmospheric fiddling has led to the planet freezing, with the only life left coursing around the globe on a Supertrain, where a perpetual motion machine replaces God and class divisions are strictly according to car, those closer to the caboose getting quite a bit less to exist on or for than those closest to The Divine Engine. 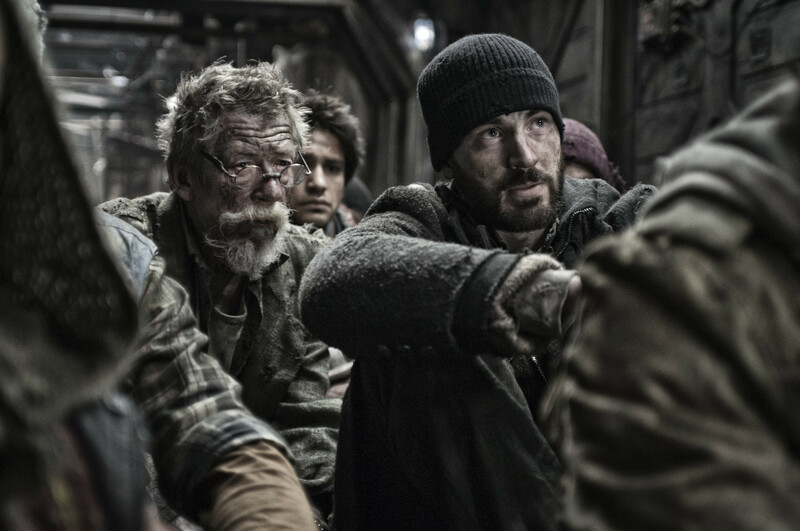 Chris Evans leads fellow peasants John Hurt, Song Kang-Ho, Jamie Bell and Octavia Spencer in a car-by-car fight-to-the-finish with the favored ones, led by Ed Harris (in his best calm-insane mode) and Tilda Swinton (raving brilliantly–talk about cheated of an Oscar nom!). Acting is splendid, the art direction, effects, interior design, gizmos, sound, costumes, makeup, editing, fighting, camera— all get solid A’s. 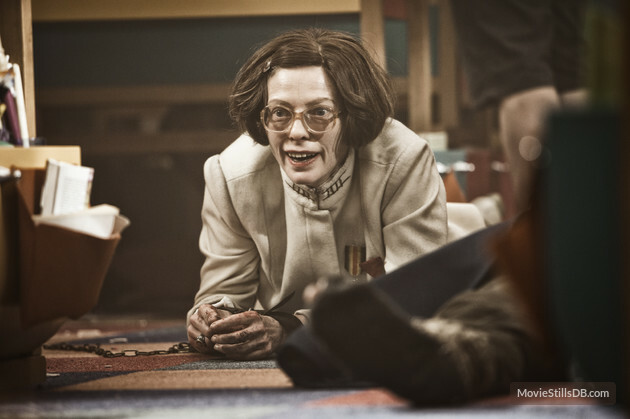 The director is Korean auteur Bong Joon-ho, who co-wrote the witty screenplay with Kelly Masterson. This Bong is loaded with imagination to burn. Shot mostly in Czech Republic and Austria, with a budget that rang up $40,000,000 but was used so adroitly it looks like a lot more. Box-office amounted to an okay $87,000,000, as it seems to be collecting fans more by word-of-mouth. This will be a cult classic, bet on it. Critics were wowed, and award-givers missed the boat—er… train. All aboard! dang! now we have to see it!